While the mainstream media has declared 2012 the worst year ever for allergies, a new study has indicated far worse is yet to come. By 2040, it predicts, years like 2012 will seem comparatively allergy-free. At this year’s Annual Scientific Meeting of the American College of Allergy, Asthma and Immunology in Anaheim, CA, it was revealed that consensus opinion is that pollen counts are expected to more than double by 2040. The primary culprit, according to a study conducted at Rutgers University in New Jersey, is a massive increase in pollen production due to climate change. In the year 2000, pollen counts in the U.S. averaged 8,455. Forty years after that, the counts are expected to approach 28,000. The prediction is based on climatic factors such as weather patterns, and changes in precipitation and temperature. The study is analyzing various plants known to cause allergies, being grown in conditions designed to mimic the future. In addition to increased pollen counts, the study also predicts that the changes in climate and vegetation will prompt allergy season to start earlier and last longer. In 2000, pollen emerged April 14th and peaked on May 1st. But, in 2040, pollen counts will peak nearly one month earlier, in early April. It may be time to consider allergy shots if this is going to be the case. Another study, by the same research team, predicted a steady increase in ragweed pollen over the past 25 years. And, ragweed pollen count peaks are expected to come two to three weeks earlier, with peaks coming earlier the farther north they studied. — Know your triggers. Pollen may be the obvious trigger, but there are others. 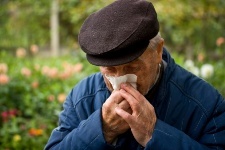 More than two-thirds of seasonal allergy sufferers actually have year-round symptoms. An allergist can help you find the source of your suffering and treat more than just symptoms. — Monitor pollen and mold counts. — Keep windows and doors shut at home, and in your car during allergy season. — Stay inside during midday and afternoon hours when pollen counts are highest. — Shower, wash hair, and change clothing after being outdoors. — Wear a surgical-style mask when doing outdoor chores like mowing the lawn. Preventive measures like these may seem a bit excessive now, but they could become commonplace in a few years. “The year 2040: Double the pollen, double the allergy suffering?” American College of Allergy, Asthma, and Immunology, November 9, 2012.